I have been distracted all week. Many, too many things going on. But more than anything, my heart has been breaking over what has happened in our deep South this week. We hear of tornadoes hitting Nebraska and Kansas and the nation's midsection every year. We have all kinds of destruction from earth quakes to tidal waves to hurricanes, and they seem to occur more and more often. But this disaster hit home for me. I have not been Home since I left the state in 1993, but for nearly a quarter of my life I lived in Alabama, Sweet Home Alabama, and I loved it. I still have a yearning for the South. I am a graduate of this university. It is just about one of the most gorgeous campuses I have ever visited, and I had the pleasure of living there for 4 years. That was Tuscaloosa. But after this week's massive tornado, estimated between 0.5 and a mile in width, that city won't be the same for a very long time. It is heart-wrenching to see the photos of the area, knowing that this is the place I lived, the place I learned, fell in love for the first time, and called home. Please, take a moment, and think about how fortunate you all are, wherever you may be. Many people have it way worse. This blog is closing to the public shortly. If you are interested in having access to view posts, please drop an email msolomo1@maine.rr.com and I will add you to the list of invited readers. I finished up a customer quilt a day ago. It is for the client's grandson's wedding in 3 weeks. She said that he selected the pattern and fabrics. It definitely appeared masculine to me. Hopefully the feathers and hearts help to soften that. I swagged the outer border and did a striped border beneath that. It was 9-10" of wide and dark green, and I did not want to feather the busy print. There are leaves in the pieced green blocks at the client's request. And a simple yet effective Terry Twist in the alternating blocks. I like continuous curve, but at this size (3") I would have used a template, and I just did not want to take that kind of time. Unfortunately the back of this quilt does is not a pretty as the top. It is a white-on-white fabric, with fairly heavy paint and does not really coordinate with the top very well. The client is aware of this, but she had it on hand and wanted to use it up. 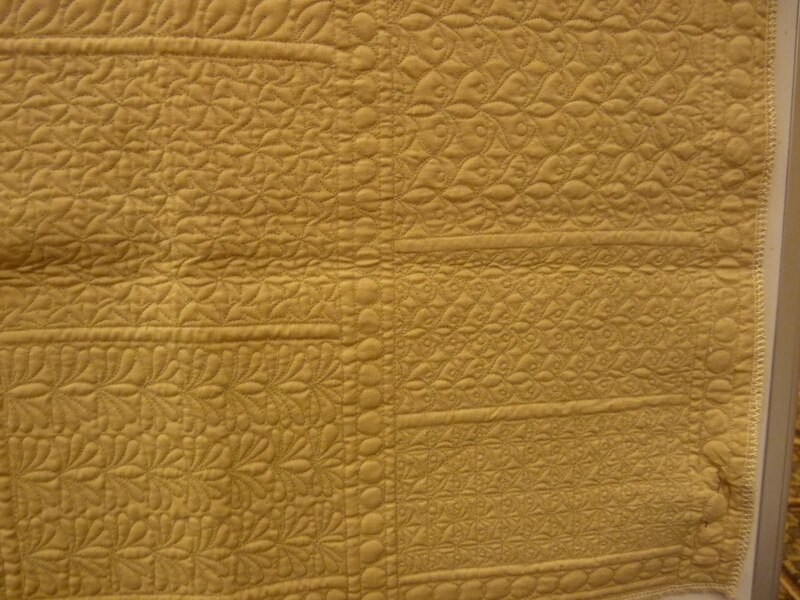 In reality, quilt backings for bed quilts don't show that much anyhow. It is just frustrating as a quilter since a white backing shows every slight bobble, and I used deep green and cranberry threads....You do the math! 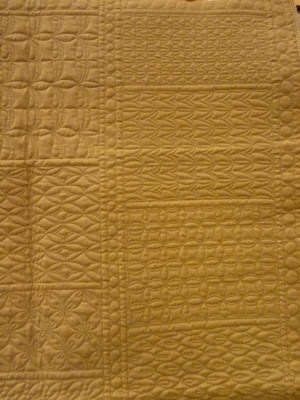 I do love it when quilts have a backing that is in the same tone-family as the top. Imagine how great this would be with a medium-toned sage green or even a green and cranberry floral??! Time to go check on the blocking of my grapes quilt. 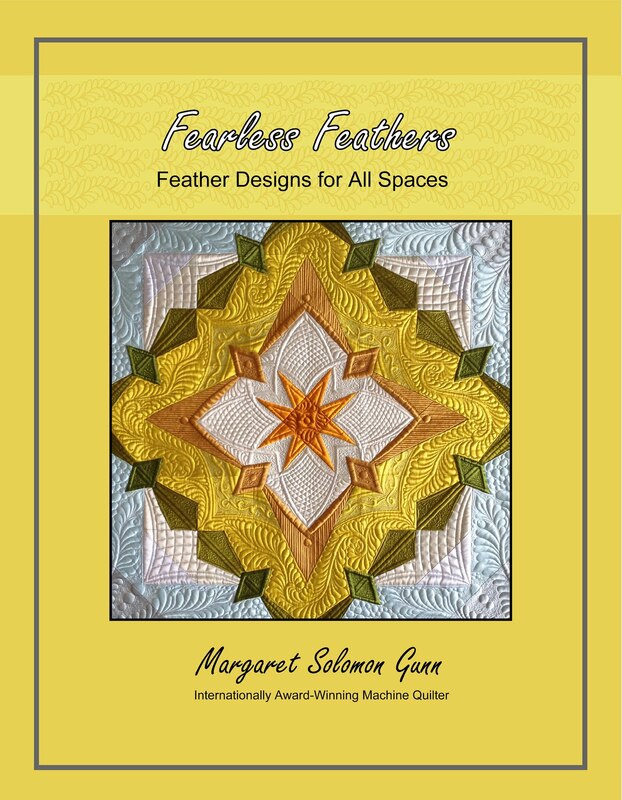 Class: Fanciful Feathers & Fillers, by Gina Perkes. Sadly, a week before the start of MQX, I received an email saying that Gina had to cancel her classes at MQX. The 4-hour hands-on class was rescheduled to a 2hr-45min hands on with Judy Woodworth, immediately followed by her 2-hr lecture class entitled Feathers & Ferns. I was a little disappointed initially, because the 4-hr classes are more expensive than than the lectures, and I really wanted to have a class from Gina. I've seen her quilting and it's fabulous. After sitting through Wednesday night's awards show, I quicky learned, however that we got the long end of the stick. Judy's quilt Avatar Revisited received a 1st place, and after seeing her work on the show floor that night, I knew that her class would be equally as good. She did not disappoint! The hand's on class was smaller because some people dropped. I did not have to share a frame with anyone, which is nice since it's not common for 2 people to quilt at the same pace. Judy's hand's on portion of the class focused mostly on different fillers that can be quilted free-hand on a quilt. She had us start out by quilting our name, then a feather, and then to try one particular type fill. She, of course, stitches these amoeba-like feathered masses in ultra-tiny dimension. Mine are quite good sized. 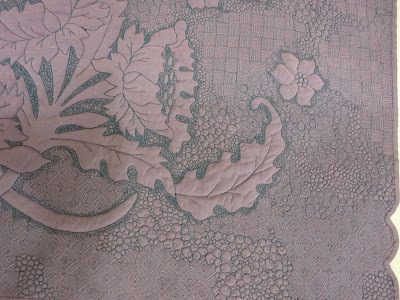 In the class, we roughed out the boundaries of a mini-quilt to be freehand quilted. She told us to do a feather in the middle (I chose to do a feathered heart - which I attempted to stitch the interior of similar to some that she'd done). Then around this "feather" we were to do a multitude of different fillers, some ribbon-candy, some micro-filling, etc. Mine is only about half done because of the time constraint, but you get the idea. 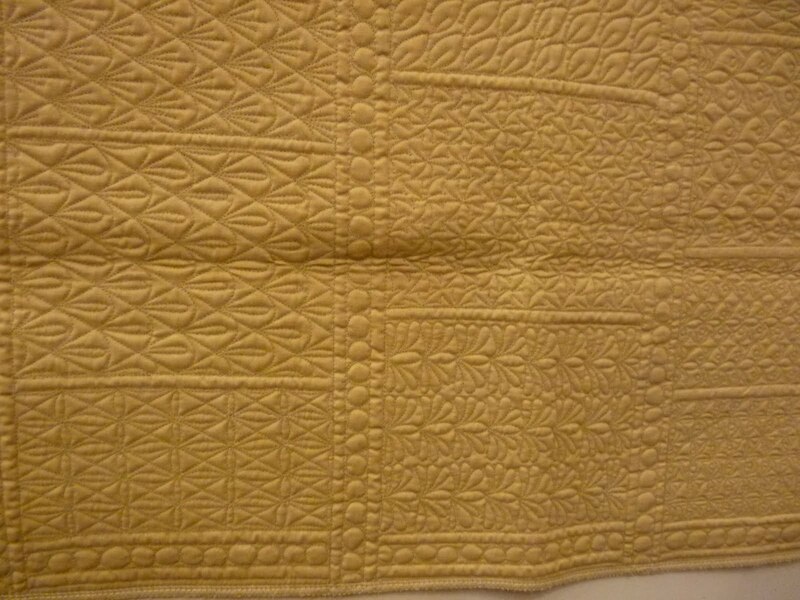 This was stitched with a gold Glide thread which I absolutely LOVE. I'll never use metallic again when there is this thread. Judy is such a dear that she told me to just take the rest of the cone since I helped her with the class setup. Seems she did not have a teacher's angel for the class. Here's a couple close-ups of my fillers. Above, she calls the one that resembles intestines "Bananas". And below is one of her signature fillers. You'll see it again later in the post when I show her Avatar quilt. 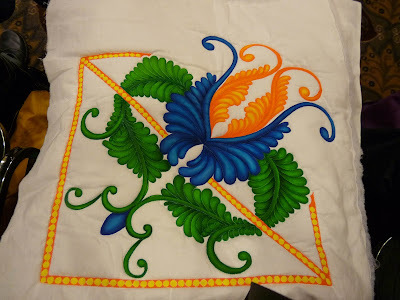 She sometimes has her husband hand paint the designs after they are quilted. These are done with Stuart-Gill paints. In the lecture, she has a full size Gammill, with videographer (displayed on a screen, which was kind of hard to see at times) assist - taping what she's quilting over her shoulder. She stitched out many different variations of feathers and ferns. Mostly I sketched these; no pictures of that except for her class samples. I have pictures of her 2 show quilts. The first one I have seen before in magazines. It's whimsical and colorful. I believe that the horses are machine embroidered. The quilting is so much more intricate and impressive in person. Avatar Revisited is her latest show quilt. 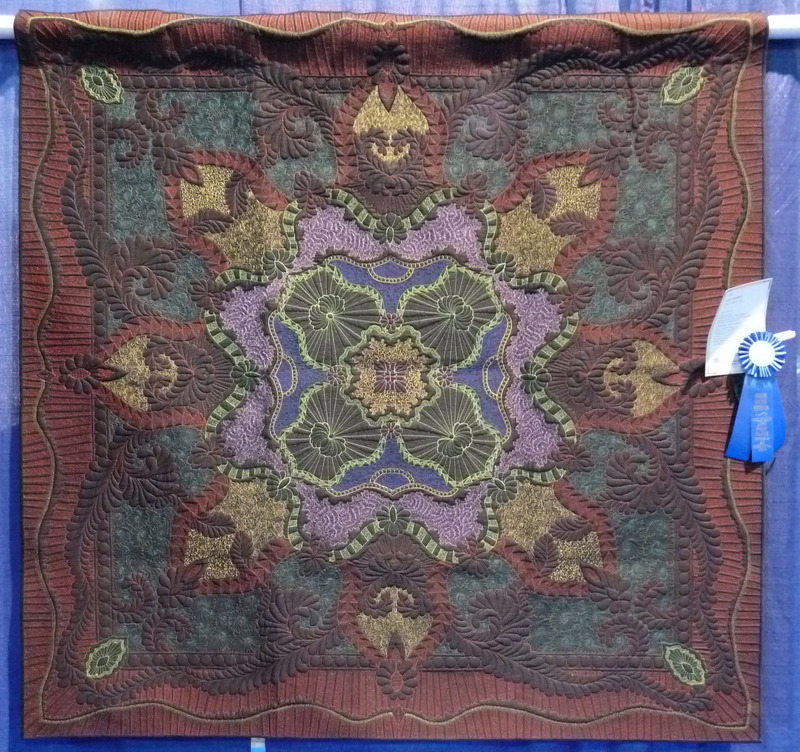 I think she was truly surprised to win the large whole-cloth class, but this quilt is modern and amazing. The background is all black, which is hard enough to sew on. I have 2 close-ups of the detail work...It has plenty of colors that I might not use together, but they work in this design. Many different fillers are used, creating fantastic texture. See her swirly-feathery-amoebas in teal thread...they are probably the size of a silver dollar. It is really a cool quilt. Kudos to Judy for winning! And if you didn't get the impression that I loved her class, I will say it emphatically. She was great - very enthusiastic, humble, helpful, outgoing, etc. She's got great stories to tell of her road to where she is today. 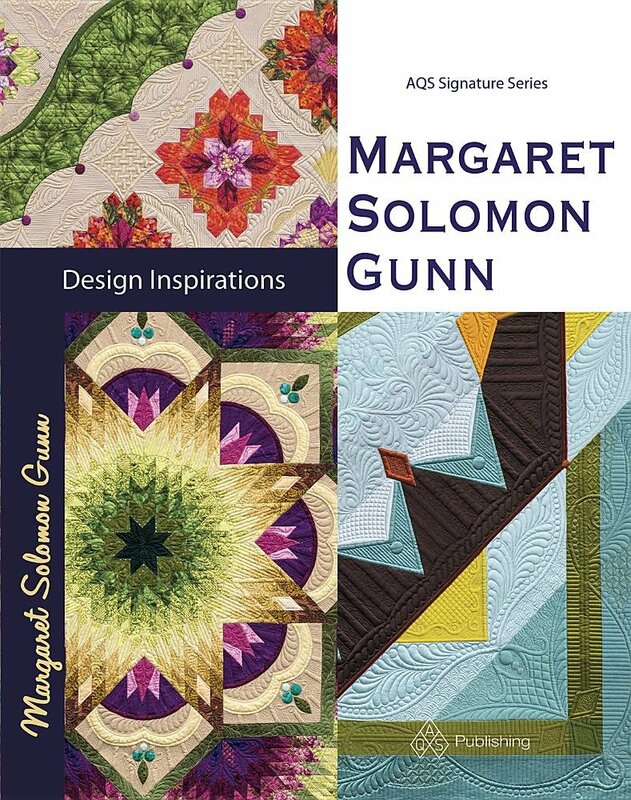 In fact, I just ordered her book "Freemotion Quilting". I think her class was one of my favorites from the show. 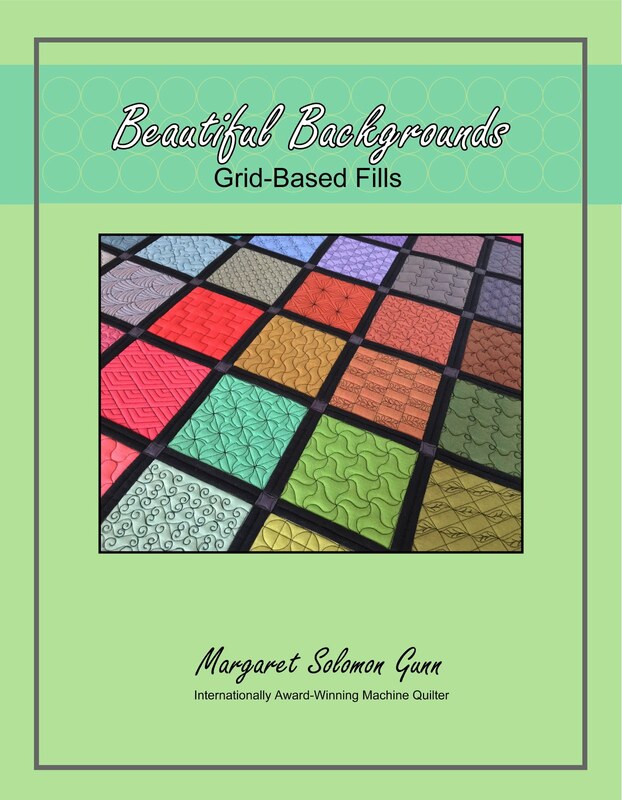 In this post, I will show some of the work done in two more of my MQX classes - Throw them a Curve, or Play it Straight by Renae Haddadin, and Background Gridwork Fillers by Dawn Cavanaugh. These are 4 hour classes, with some instruction time and some on-machine quilting time. Now, bear in mind that I signed up for my classes last November, nearly 6 months ago. Coupled with the fact that class descriptions can be a little bit vague as to their complete content, I managed to sign up for a class in an area that I am really pretty comfortable. If the description had read "curved cross-hatching, grids" etc, I probably would have passed on it. I had seen several of Renae's competition quilts last year, as well as one of her teckie-talks for YLI threads, and I was easily enticed by her class. She's outgoing, enthusiastic, and energetic. She's much like that part of me that needs to be very exacting, so I see the angles where she's coming from easily. She's a great template quilter, using them to their complete potential. For some reason, I don't have much quilted on my class sample. I think I must have spent more time gawking at her work. Anywow, we talked about ways to place grids in borders, blocks & sashings so that they are either centered, or on a square grid. I've never used adding-machine tape, and this is a great and cheap tool. Must go and buy some! We also played with simple curved crosshatching. Eight different thread colors are used, but these only show in the white areas or on the back (which I did not photograph). I actually think that the colored areas of the quilt are feathered, but you wouldn't know that from the front! The colored cross-hatching is tiny, about 1/8". She cross-hatches using the ruler, which is marked at 1/4" and then eye-balls between 2 lines. From there, the ruler can be used to cross-hatch the rest of the 1/8" divisions. I'd have a mess on my hands doing this for sure! This is a Christmas tree skirt that Renae made. The curved cross-hatching is done in a metallic thread, again at minute 1/8" spacings. I love the rest of the fills, but I suspect that they don't show in the pictures. The feathers around the border have the tiniest pebbling around each feather - she is a definite massochist! 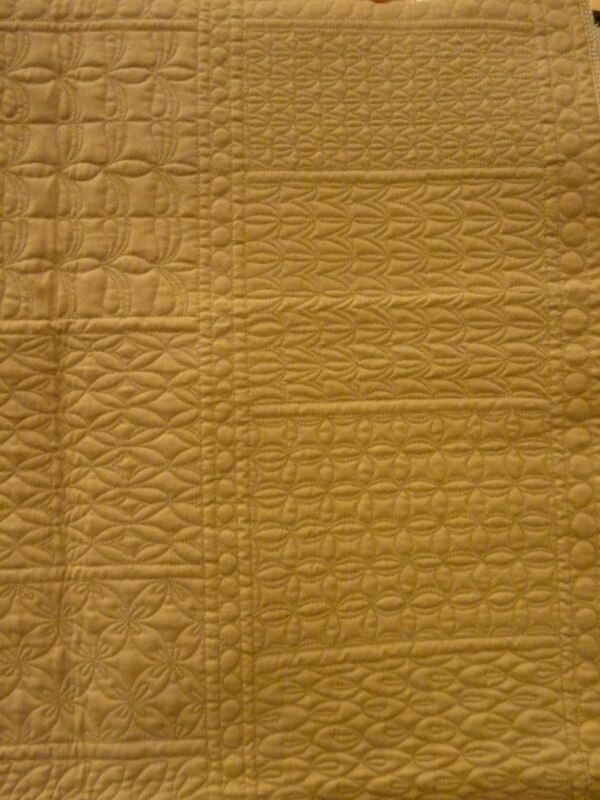 Here is Renae's competition quilt - It won 1st I think in the miniature quilts division, measuring barely 16" square. 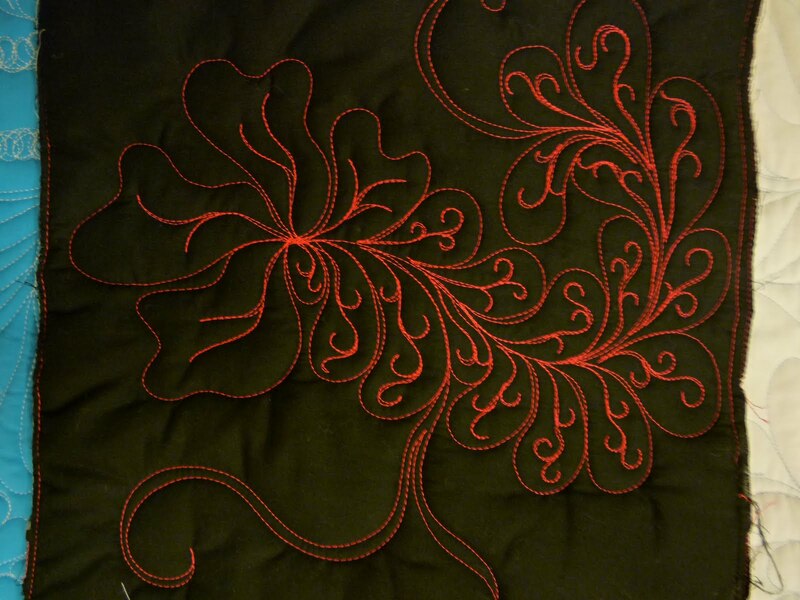 The center is a lace panel, but the white around the border is all done with thread to look lacey. I had heard of how much people liked Dawn's classes, and figured that to learn more fillers would be a good thing. We spent the first couple hours of the class drawing the sample fillers using dry-erase pens on a clear sleeve with a marked grid beneath. Some were a little trickier to commit to memory, but most created a really neat effect. This is part of my class sample, which was done somewhat in haste since there really was not appropriate portioning of drawing and quilting time in this class. I got all but a couple of the fillers stitched out on my sampler. She had the 1/2" grids all premarked for us. The patterns done on the 30-60 diamond grid were trickier. On some of Dawn's samples, she actually stitched out the grid too. This creates a denser filler, and would allow whatever is around the filler to really pop, like an applique element. 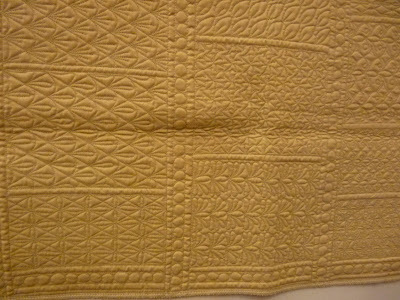 The next pictures are of Dawn's sampler. These have all been soaked in water to remove the blue lines, so the batting and fabrics have pulled up a little. And lastly, the teachers racked up the ribbons at the show. 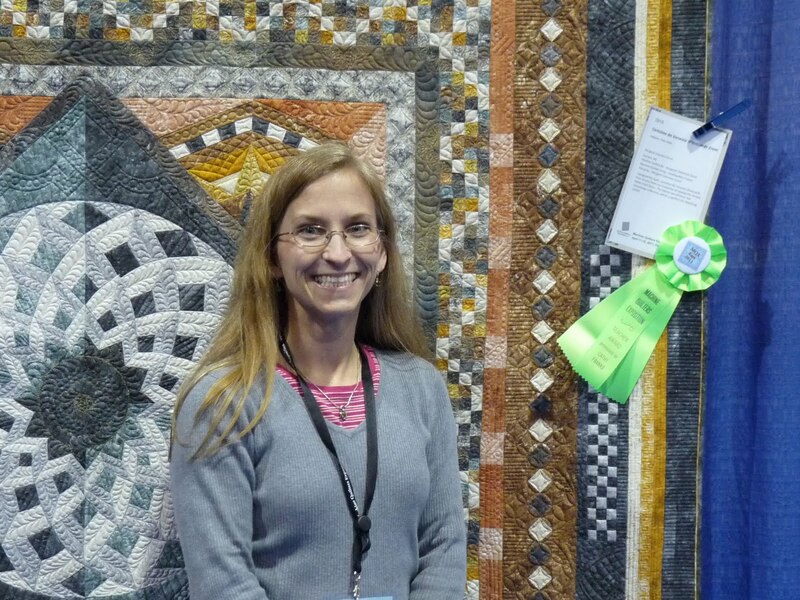 Dawn's quilt received a 2nd place ribbon. 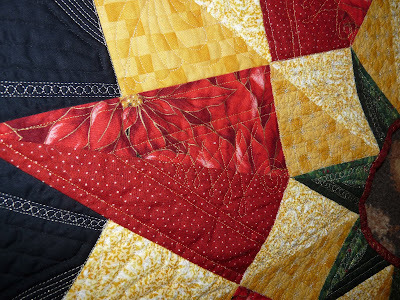 It just goes to show that you can have a relatively simple design (15 stars), with knock-out quilting to win! Here's a closeup - her feathers are lovely and whimsically stitched. I really like the effect of the pebbling. yes, you guessed it, as in Judge Linda. I had hoped to take her Judges Review seminar, to gain insight into what judges look for, but it conflicted with my other interests. I took this instead. 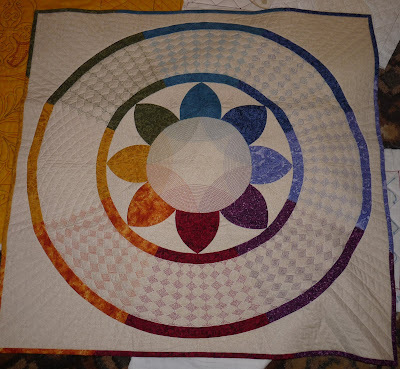 It was advertised as a "wholecloth" class, so I really expected it would be a more conventional approach - where a design is made that encompasses one-eighth of a quilt, mirrored, etc. - similar to what I am taking online at MQResource (and have shown barely a picture of my progress - doh!). 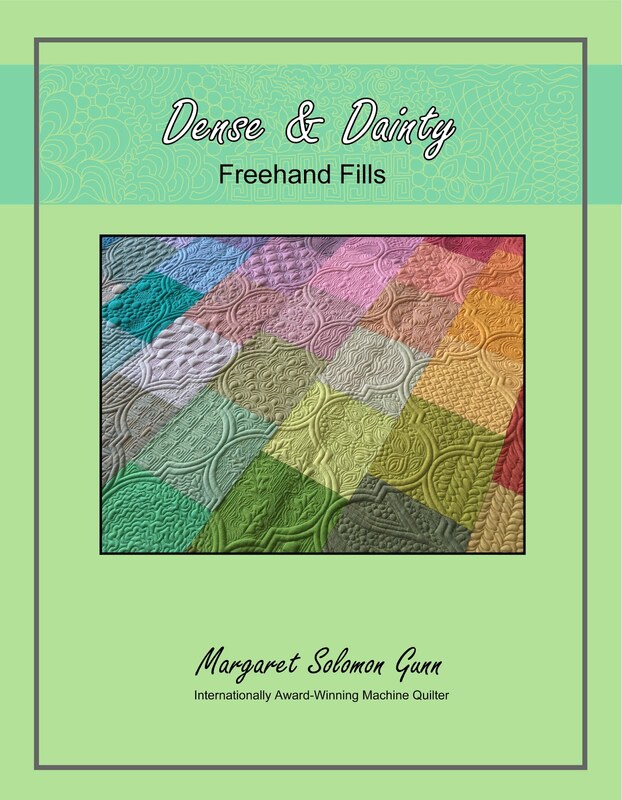 I was pleased to see it was different than that, and focused largely on placing geometric "splotches" of design within other free quilted patterns. None of this was done with rulers, except to mark the grids. This is my mostly finished mini-quilt. I had it maybe half-done when I left MQX, and put it on the machine on Sunday afternoon to complete. I have several customer obligations as well as my own show quilt to finish, but I knew that this would only take a couple hours. I have 2 more incomplete quilts from MQX classes to finish eventually as well. BTW, the basic poppy part of this quilt was already marked for us. We started by outlining that, and then marking and stitching our backgrounds. She brought 5-6 of the same quilt, all done with different fabrics and different threads. 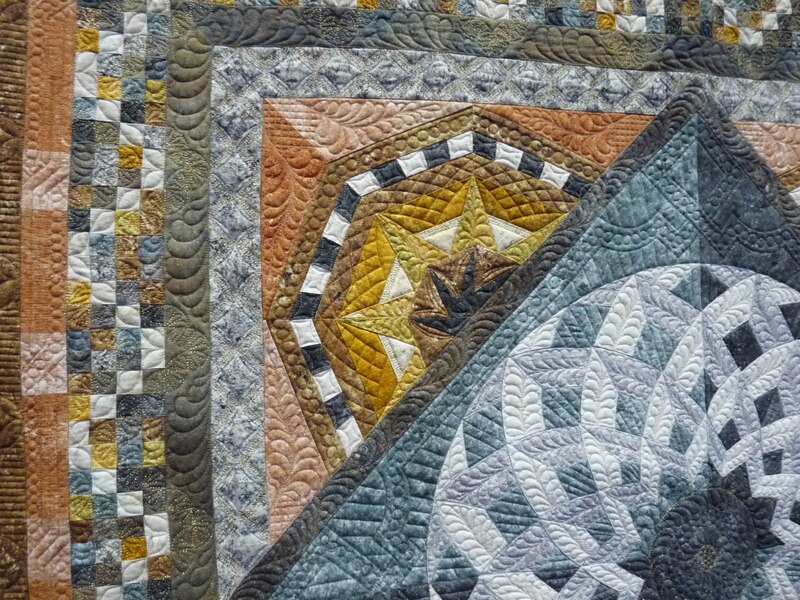 Her style on these quilts is much like how I want to think - love the appearance of meticulous details, but doesn't want to be bogged down with time-consuming things and excess order. These quilts are about being random and free-handed. Now, once I email her the picture of my completed quilt, she says she'll mail us binding that matches! FYI - this is a polished cotton with a single wool batt. I've never bought or worked with this type fabric, but it has a nice sheen and she recommends it for wholecloth quilts. Here's a couple of suppliers for those interested...www.fabricall.com ($6.99 per yd for 54" wide) and www.paylessfabric.com ($6.25 per yard for 44" wide) - several colors available. Linda had a special exhibit at MQX also, displaying 10-12 of her quilts from over the years. I love studying her style, so I have several closer-ups. Enjoy! This (I think) is actually a close up of the 1st one I showed that appears pink. So much marking involved in these quilts. I'm sure there is some other snazzy subtitle that this post ought to have, like "Making Money at Margaret's Expense" or "You, too, can have your face on a truck...Here's how!" or "Larger than Life", but somehow my cleverness in creating an appropriate title is lost. 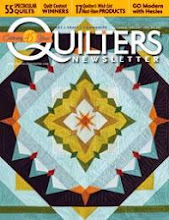 But seriously, being selected by Handi Quilter to be a part of their 2011 advertising has been a fabulous treat. If I said that I'm ashamed or embarased by having my face behind their machine, I'd be lying. This is a great thing. 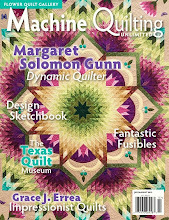 If you own a HQ machine, you can send in your quilting story for a chance to do this too. Anyhow, Handi Quilter is a big sponsor at MQX, as well as other quilt shows, meaning that their CEO Mark is in attendance. It was nice to see him again and get a few moments to talk. He's a very busy man. He was just about to take off for the Australasian Quilt show when I saw him Thursday (which was over by the end of this weekend!). HQ had a vendor's booth (of course) with a number of their machines always in use by prospective new owners. And a couple of us were lucky enough as to have our banners gracing the booth. I had to have walked by this four times before one of the HQ educators showed me that it was there! Of course, after returning home, my mom informed me that the MQX live cam which was on during show hours, showed the banner of me! I missed seeing the SLC HQ educators, but got to meet a nice group of others from around this area. My first class on Wednesday morning was in one of Handi Quilter's furnished rooms - a dozen Avante's! The HQ educator helping in the class was Mary Beth, who almost immediately recognized me. I'm not really sure if she recognized me or if she knew to expect me. I mean, would you recognize someone from a picture on a banner (or a truck??!). She turned out to be one of last year's My Story winners (see the link above), and a great asset in a class. About a half hour later, Mark dropped in as well, recognizing me too. In another class, I offered to help out Judy Woodworth with class handouts and $$ collection, as a teacher's angel was not in her class. I got to Kristin B., and immediately knew I knew her from somewhere. We tossed out a couple possibilities and soon realized it was the Handi Quilter connection. She was another of last year's faces. Really cool to make these acquaintences. So, on Thursday morning, after mistakenly arriving to the convention center an hour early, I ventured out behind the parking garage in search of a "Truck". 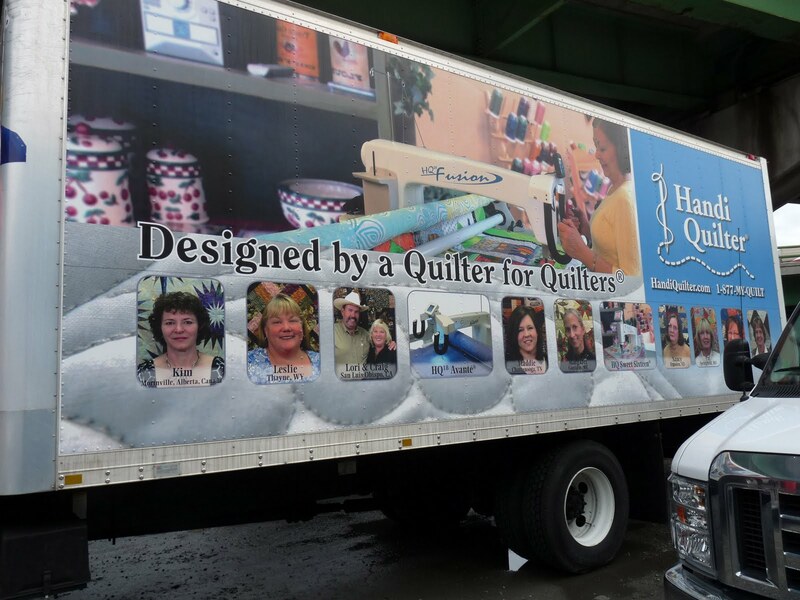 Not just any truck...I wanted to find the Handi Quilter truck. Now this is downtown Providence at morning rush hour. There's plenty of people driving around as well as walking. And here I am - stomping through a chain-link fenced parking lot (which is massively muddy thanks to receiving over 3" of rain the day before). But, as you can see, I did find the truck, parked deeply in this parking lot. It actually had another truck conveniently beside it with people still in it, so I asked them to kindly humor me and back up for 12 seconds, and to specifically not ask why I was photographing a Truck. They were puzzled, but did oblige. If you ever wondered what I looked like in abut 30"x30" closeup, here it is. 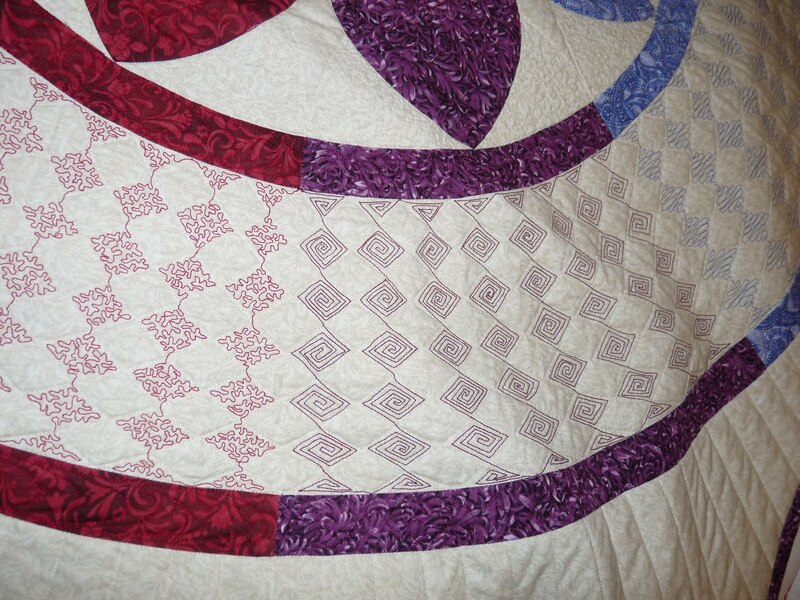 And the quilt looks pretty nice too (thanks to the gals of the Row Robin Swap from a couple years ago that helped with a couple of the blocks you see). I will have several posts about the Adventures of MQX; this is only the first. Many pictures need to be resized for blogger first. I spent 3 full days in RI, taking 5 half-day classes, and walking the floor of the show many a hour. It's a mind boggling and exhausting journey, and I am SO thrilled to have done it. 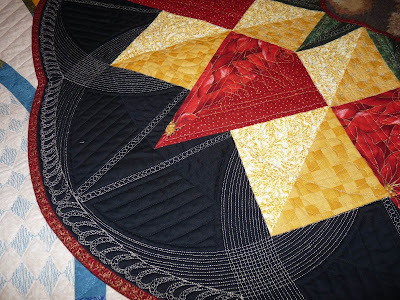 I have many tales and many pictures, but this first post is mostly to show some of the quilts. Now, I went to the awards show on Wednesday night, mostly because it was free and then you could have admission to a sneek peak of the show and vendors. I was 99.9% sure I was not getting a ribbon, and I didn't. The top 3-4 quilts in each division are always really good. Like over-the-top unimaginably good - not even in my wildest dreams good. You get the idea. So, Wednesday night, I perused the show for an hour before taking my exhausted bones back to the hotel. I had all Thursday afternoon to look & shop. When Thursday came, I had my bearings. I knew which quilts I specifically wanted to look more carefully at and photograph. And when I got to this one (yea, it's mine!) imagine the surprise to my tired eyes! It had a teacher ribbon on it. These ribbons were not announced at the show the night before. It was such a fantabulous surprise. I had to find a white-gloved MQX helper to take a picture :-) I named this quilt Cartoline da Venezia (Postcards from Venice). It was a big holdup in my signing up for the show because I couldn't come up with a suitable name. Somehow The Italian Floor Quilt seemed inadequate. I will show you the label eventually, as it ties in with the quilt's name. I know you have seen many other detail shots of this quilt in previous posts, so I won't bore ya'll with too many of those. It escapes me how some quilters can spend 100 hours quilting a quilt and then just sit on it until a show. Seriously - I haven't got that kind of control. Here are links to previous posts...Look here, or here, and here (scroll down for a shot of the back). The progression of this quilt was not always a smooth one (remember the Sharpie pen incident?? ?...BTW, it all came out! ), but I'm happy with the end result. 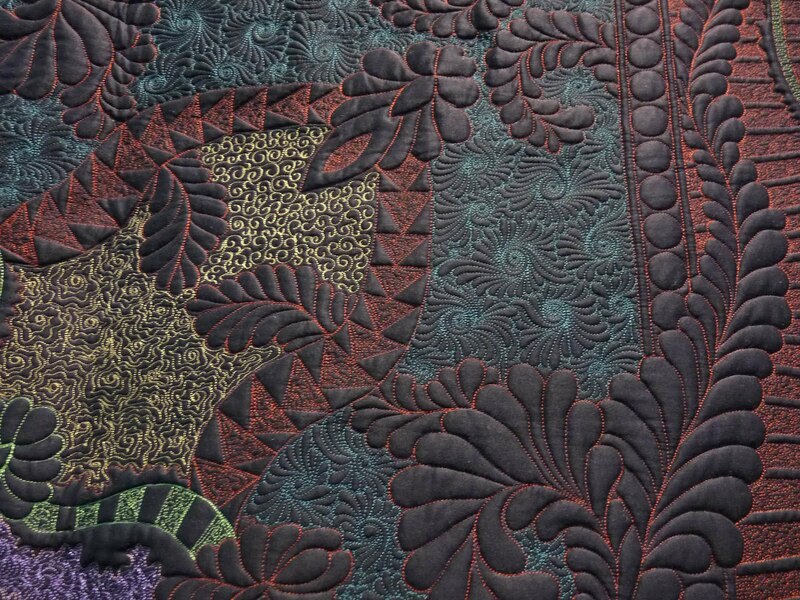 One thing I noticed after spending countless hours staring at quilts is that many quilters used higher contrast or just downright blaring colors. 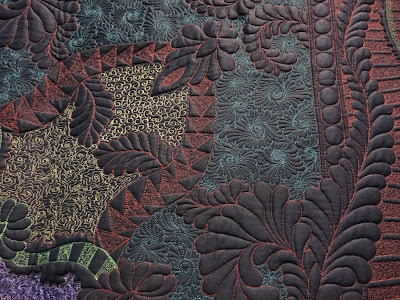 Show quilts seem to break all the rules of color combinations. The brighter the better. Maybe it is to catch people's eyes, or the fear that the judges will not remember their's if it's not bold. Dunno, but it's one of those things I'll tuck in my knowledge hat for next time. As busy and bold as I thought mine was - It is subtle in comparison. The teacher that gave my quilt the ribbon was Dustin Farrell. Now in all honesty, until this week, I had never heard of him. But he managed to walk away with quite a purse of cash at the awards. 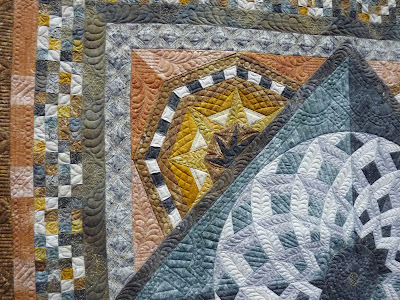 Here is one of his quilts from the show. It is only about 24"x36", and has a whopping amount of thread. He said that there is more than 6000yards of white thread on the piece! There's barely a thread of fabric to be seen! All of the details of the animals and trees are thread-painted. There is amazing detail and accuracy. 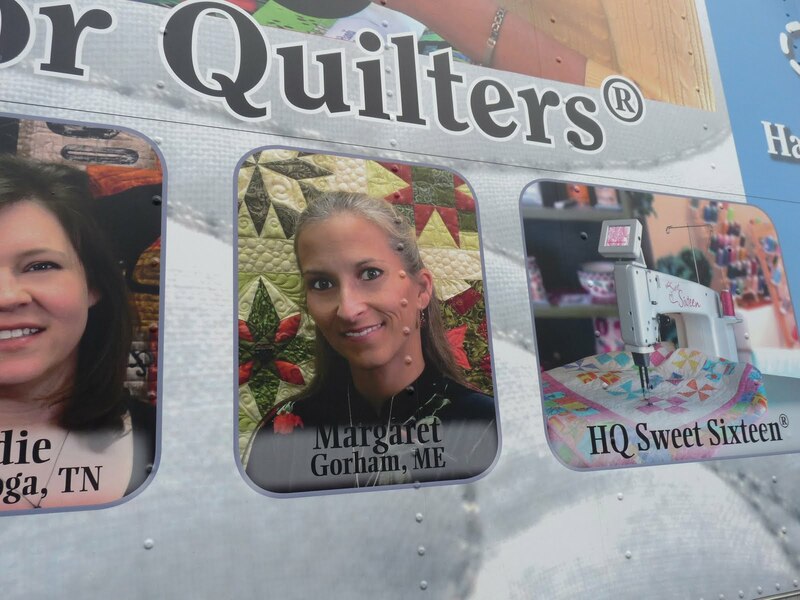 To have had this person place the ribbon on my quilt is quite an honor. This quilt intrigued me because it is largely made from the same fabrics that I used. It's someone else's take on an inlaid floor. A gorgeous and well-ribboned carpenter's star. I payed particular attention to this type of quilt (and there were a few) since I will have to quilt my own one of these in the coming months. 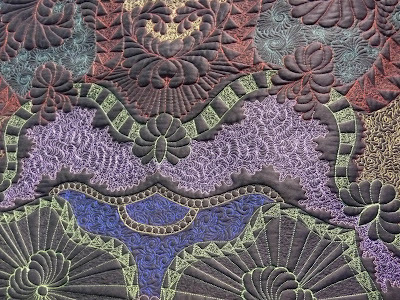 Purely traditional quilts are in the minority, but this applique is pretty. I love this one - the way the colors explode. It is all raw edge applique. 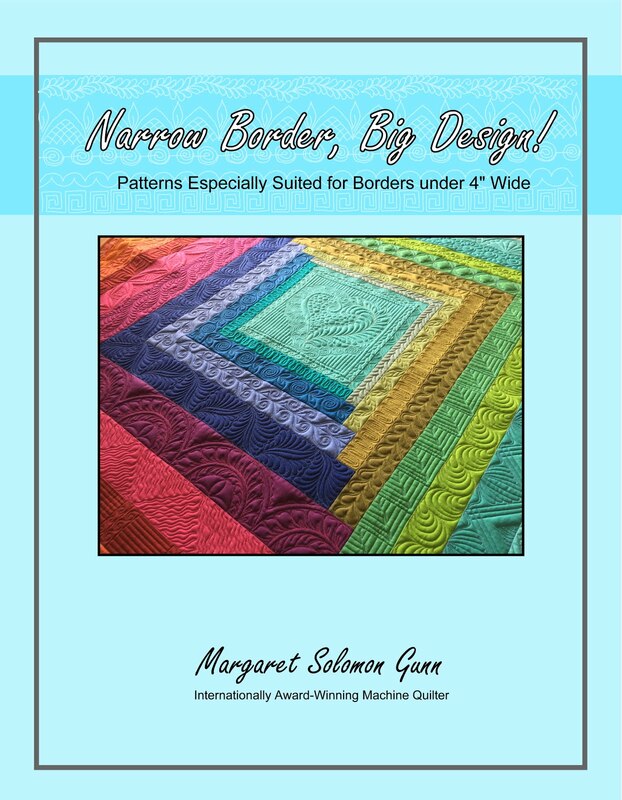 Here's a great quilting job for a New York Beauty quilt. There were many quilts of animals. I love the mix of the traditional quilt background with the dog. The quilt in the dog's mouth must have been fun to work out. This is by Claudia Pfiel - Cordoba is simply amazing. It's one of those over-the-top quilting jobs, and is adorned with an absolute ton of crystals. Her quilt won the Best in Show here last year. I can only wonder why this only received a 3rd. As an aside...I had wanted to attend a lecture by judge Linda McCuean about the Judging Process, but couldn't work it into my schedule. 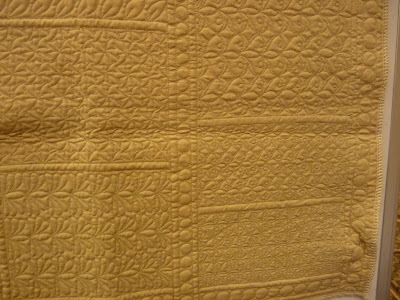 There's much to learn still about why judges score certain quilt higher or lower than others. 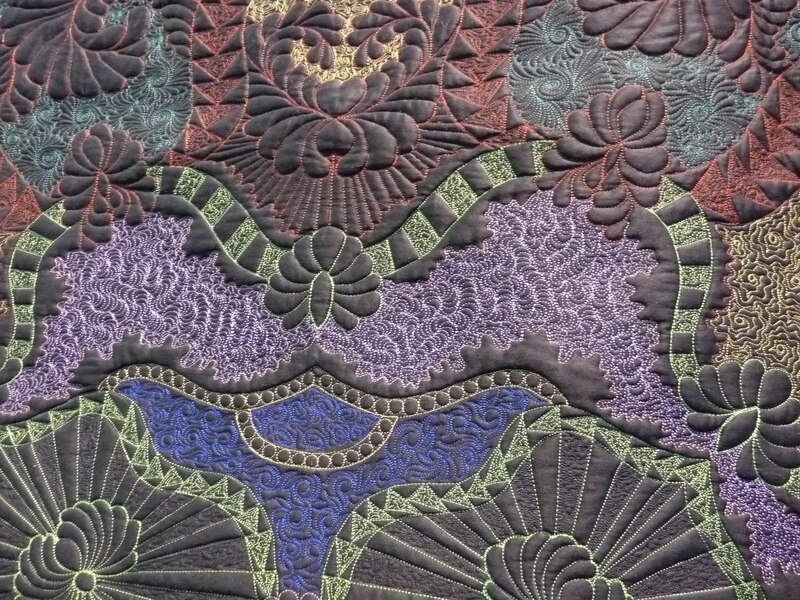 Obviously, I have a ton of closeups since they show more to me as a quilter than full quilt shots. Here's another bright one, and a nice NYB. This is either a wholecloth or a miniature; I can't remember. It's maybe 14" square, and al of the checkered squares are colored with thread. Mind-boggling. 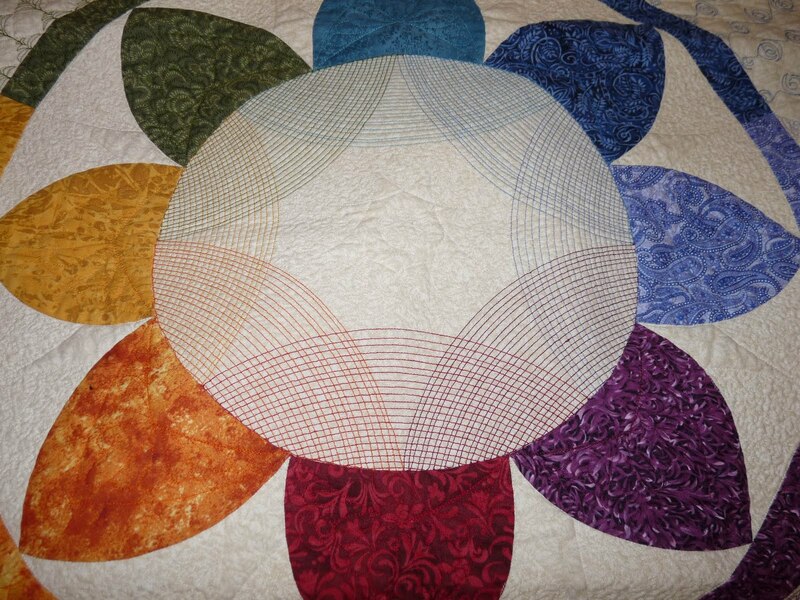 I love how the ribbons swirl, and the quilting floats in the background. And this is for all the avid paper-piecers out there - The leaves & roses are paper pieced and looked so realistic. 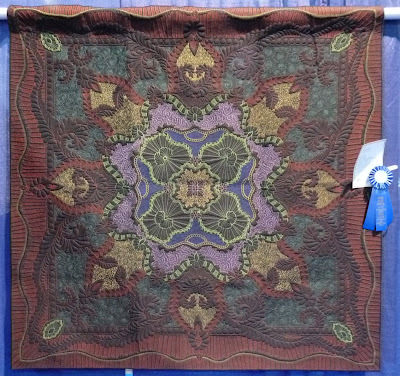 The fact that this quilt won the Best in Show is just further testiment that I know so very little about the judging process. It didn't win a ribbon in the category that it was entered. I just don't understand that whatsoever. Someone with more knowledge of this process should enlighten me, please!! I'm not saying that this is not deserving of the title. I'm only trying to understand why it does not also have a ribbon from it's division. Inquiring minds need to know!